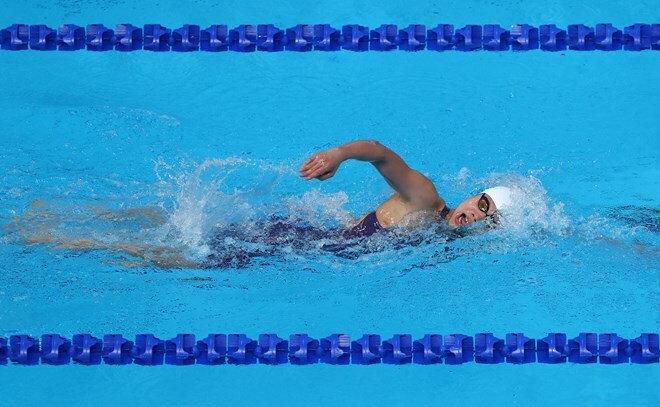 Kuala Lumpur (VNA) – Swimmer Nguyen Thi Anh Vien secured her 6th and 7th gold medals at the ongoing SEA Games 29 in Kuala Lumpur on August 25. In the women’s 400m individual medley event, Vien made her victory after completing the race in 4 minutes 45.82 seconds, about 5 seconds faster than the runner-up, Azzahra Permatahani of Indonesia. Not long after that, Vien seized another gold medal, her 7th at the Games, in the 50m backstroke event with a record of 29.26 seconds. Also on the day, swimmer Paul Le Nguyen came third in the men’s 50m freestyle event, obtaining a bronze medal. Later, Nguyen Huu Kim Son bagged the gold medal in the men’s 400m medley competition and set a new SEA Games record at 4 minutes 22.12 seconds.